Lenovo IdeaPhone S720 is aiming at the budget-conscious, but still packs a pretty good punch. On tap for Russian, Indian and Indonesian markets, The Lenovo S720 runs only Android 4.0 Ice Cream Sandwich, and no word is given on an eventual update. The phone sports a dual-core MediaTek MT6577 processor clocked at 1.2 GHz, a large 4.5-inch 640x960 pixels display, a generous 8 MP camera and Dolby Mobile audio. We found the device well-built, with ergonomic rounded corners, and a relatively thin chassis with soft-touch plastic on the back providing for a good grip. The camera is somewhat oddly placed at the upper left corner on the rear, so you have to keep that in mind not to cover it with your finger while taking a snap or shooting a video. 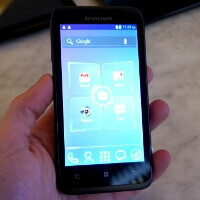 Take a look at our hands-on pictures and video of the Lenovo S720 below. The iphone has the camera on the exact same place, i dont see anything odd about it.